Recently a partner in ministry told me that he didn't want to meet up with me because he had called me "Gerry" by mistake one time at the ballpark in Toronto several years ago, thinking I was Gerry Organ. He's been embarrassed ever since - apparently. Today our paths crossed in a Tim Hortons coffee shop and we had a great time of fellowship and "shop talk" about ministry issues. Now do you really think I look like Gerry Organ? 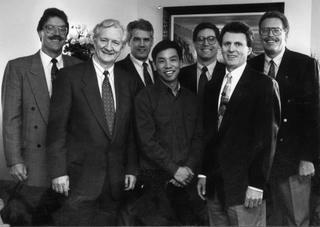 This photo was taken when we were both on the committee to plan and stage a men's outreach during Billy Graham's Mission Ontario back in 1995. That's Gerry on the extreme left and David on the extreme right. And NO, we are not extremists. Many people have got us mixed up over the years. We were both on staff at The Peoples Church in Toronto but not at the same time...Fortunately. It was great seeing you today, Chris! Keep doing the work of the Lord in the power of His Holy Spirit and leave the results with God. I'll leave out your last name to save further embarrassment. I love you, brother!